I don’t know about you but I like eating soup as it is my all-time favorite comfort food. 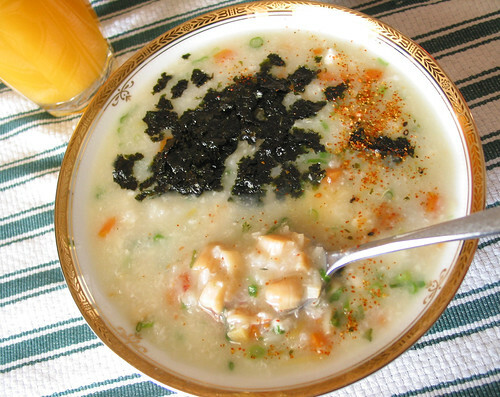 When I saw Maangchi making this abalone porridge, it reminded me of the similar rice soup I made often in the distant past using fresh seafood (scallop & shrimp) and white fish and very occasionally with chicken. Maangchi’s recipe inspires me to take this familiar dish dressing it up with Korean flavour (sesame oil and roasted seaweed nori) and sends me on a search for some fish to be the main flavour of the soup. Upon reading about dried scallop I decide to use it because I think this salted version of scallop would impart a lot of taste to the soup. And I was right for this soup packs a wallop of umami from the scallop alone. You wouldn’t need to season it with anything else but I recommend a bit of fish sauce which enhances the already flavorful soup with yet another complex umami. If you like me, a pinch of sea salt would tight everything together but it is not necessary as the broth has plenty of salt from the dried fish and fish sauce. 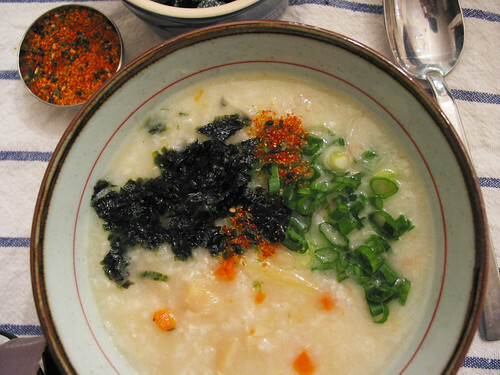 I thought the use of diced carrot is brilliant for it brightens up the mostly white soup and nicely contrasts the bright and dark green color of spring onion and seaweed. 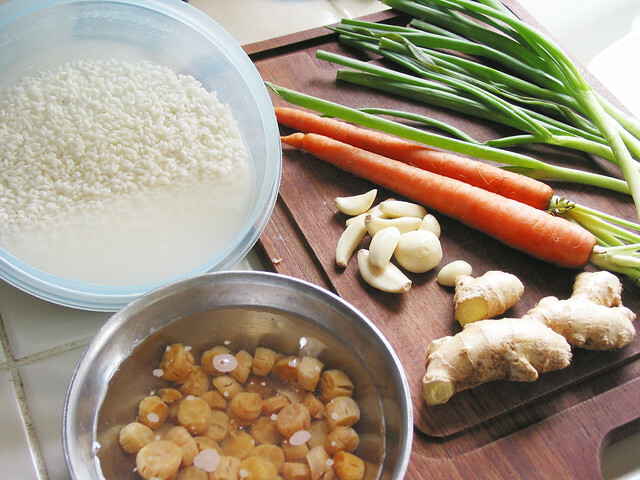 I love fresh ginger so use it generously in my version of the recipe. I won’t describe how it good tastes but I tell you this: it is food for the soul and feast for the eyes. So good so that when I offered some to friends they came back asking for more and wanted to learn how to make it. Go ahead make some and discover it for yourself. It freezes well only if there would be any leftover. Let’s make the soup, shall we. 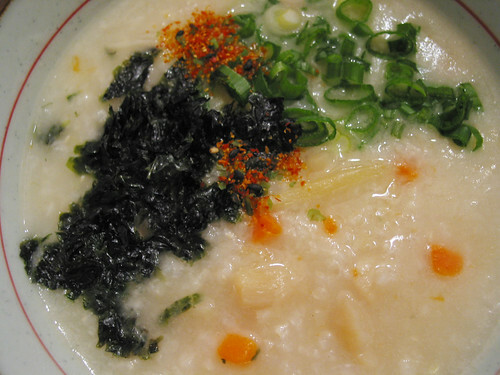 ** I use Haiga rice or Japanese short-grain rice. 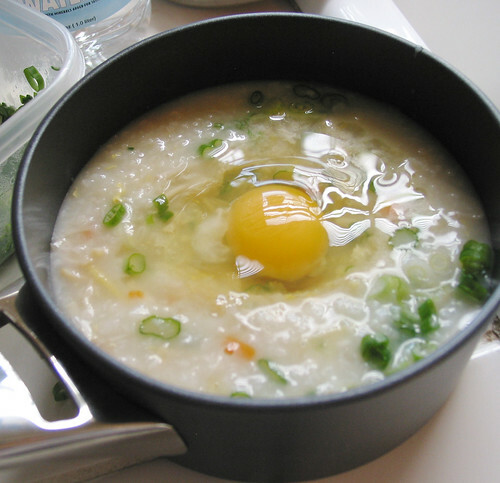 If you use other type of rice, add an extra 1 to 2 Tablespoons of glutinous rice (sticky rice). I do not rinse Haiga rice but other types of rice. 1. 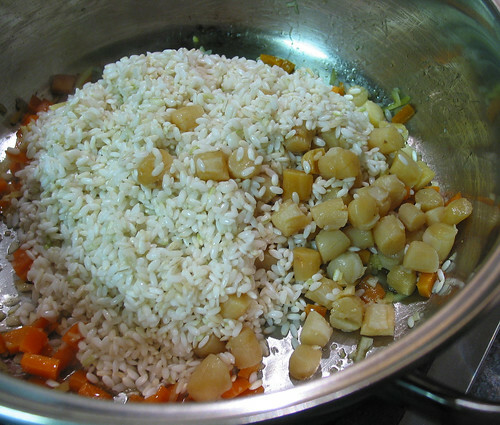 Soak rice and scallop separately in water, for at least 2 hours before cooking. 2. 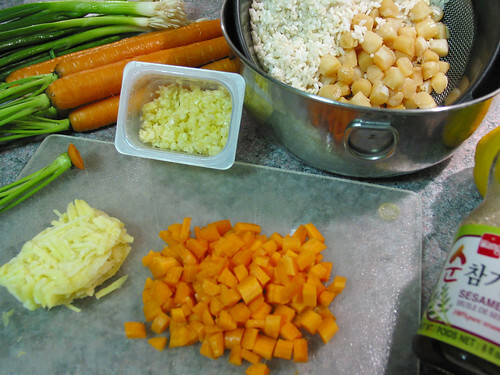 Prepare garlic, ginger and carrot. 3. Drain the rice and scallop, reserve the soaking liquid. Add more water to measure 1.5 liter or about 6 ¼ cups. 4. Preheat a large soup pot over medium heat. 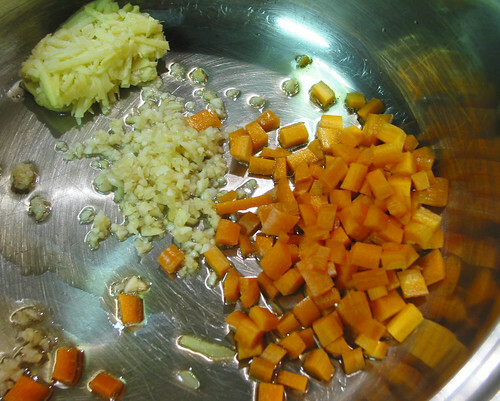 Add the sesame oil, ginger, garlic, carrot and sauté for 1 to 2 minutes. Do not brown the garlic. 5. Add the scallop and rice. Continue sautéing to well coat the rice with oil. 6. Continue stirring and cooking until the rice grains look translucent, about 5 to 7 more minutes. 7. 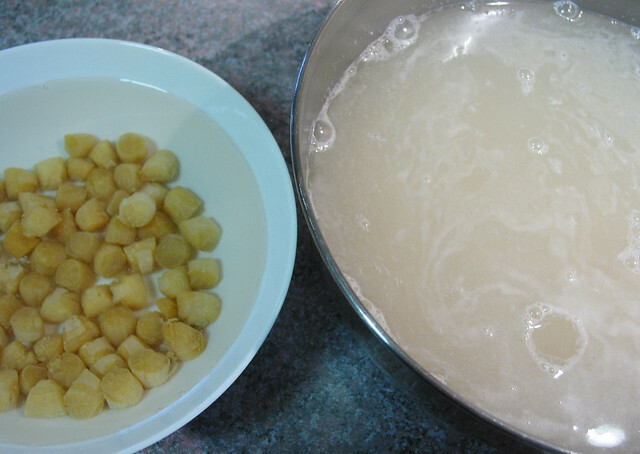 Add the measured liquid to the pot. Bring to a boil, then lower the heat to simmer. Cover the pot with a lid. 8. 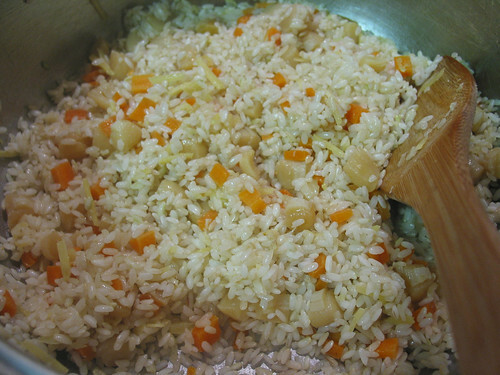 Cook until the rice is well expanded, about 50 to 60 minutes; stirring occasionally. 9. 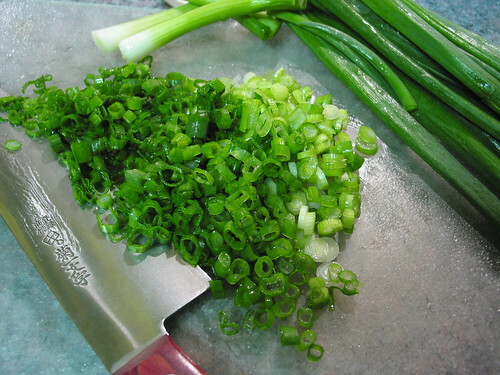 In the meantime, prepare the green onion and wash the dishes. Crumble the seasoned roasted seaweed in a plastic bag. 10. Add the fish sauce. 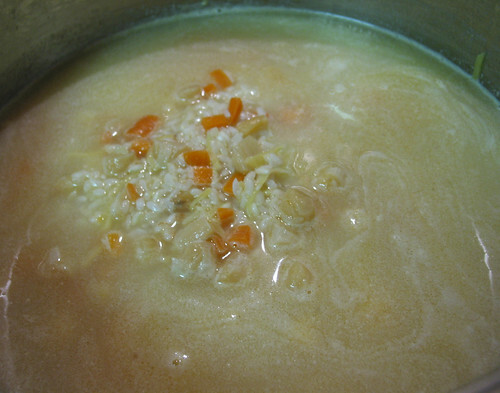 Add more water to thinning the soup if it’s too thick for your taste. 11. Season with sea salt only if necessary and cook for about 5 more minutes. The soup should have a creamy consistency by now. 12. Turn off the heat. 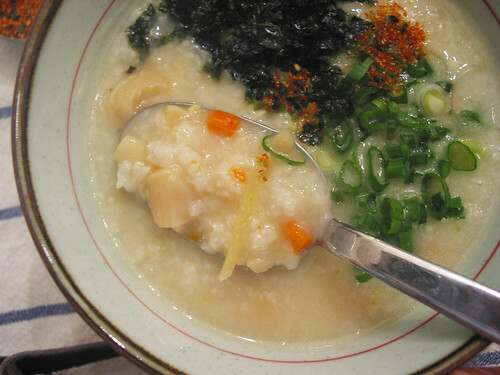 Ladle the soup in a bowl and garnish with the condiments. I particularly enjoy this soup with an egg simmering slowly in a serving portion to poach its white and yolk to a softness perfection. Heavenly! In a spicier version with a quarter teaspoon of garlic chili sauce. Yummy spicy! And those tender pieces of scallop just melt as soon as they touch your tongue. I can’t get enough of this soup. Addictive! There are many ways to prepare quinoa, which I have eaten for years and it has recently become trendy, as a one-dish meal, a side dish or can be used in a creative salad. 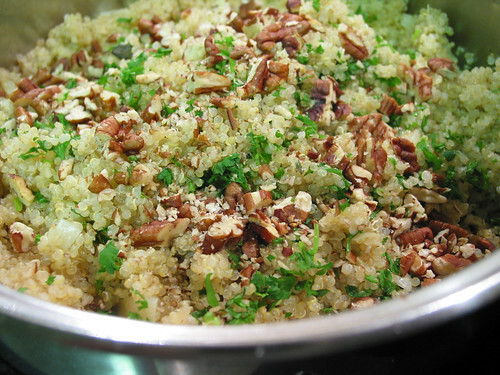 Cooked quinoa takes on flavour of any dish it is served with, very well. It is fluffier than rice once cooked and packs a powerful 20 percent of complete amino acids, the most of any grains & seeds. 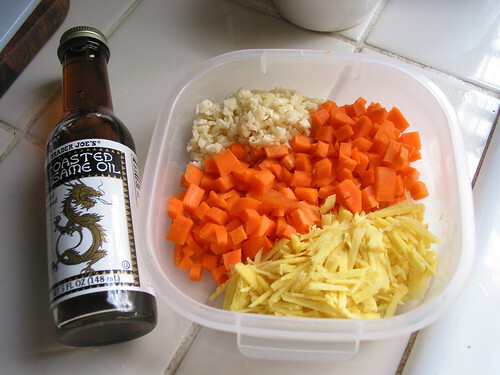 As long as I prepare it as a side dish as in place of rice, I like the ratio 1 part quinoa:1.5 part liquid; anything else thrown in is a bonus. Here is one simple way that I often prepare and serve it as a side dish which many friends have enjoyed. You can easily double or triple this recipe. 4 servings, as a side dish. 1. 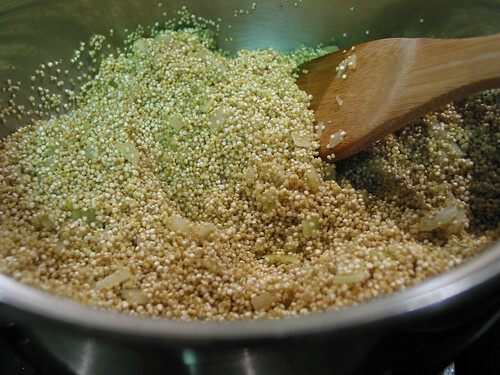 Thoroughly wash the quinoa using a fine mesh sieve, set aside to dry, at least 20 minutes before cooking. 2. Wash the herb, set aside to dry. Roast the nuts, set aside to cool. Heat the liquid in a microwave or let it simmer over a stove top. 4. Sauté onion in olive oil in a heavy bottom pot over medium high heat until the onion well coated and slightly soften, a few minutes. 5. 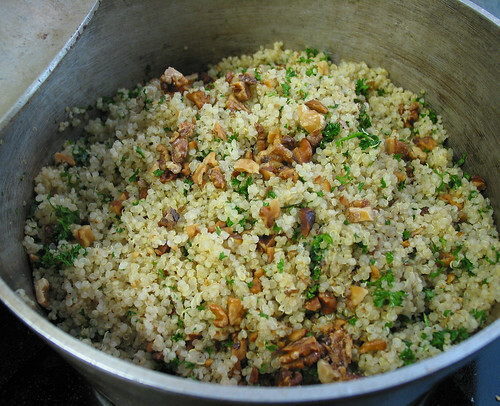 Mix in the prepared quinoa, and sauté until a nutty aroma comes out, about 5 minutes. 6. Carefully pour in the prepared liquid for it might splash. Bring it to a boil then turn down the heat and let it simmer, well covered. You might want to season it lightly with sea salt at this point, to your taste. Let it simmer for about 20-25 minutes. 7. In the meantime, chop the herb & the roasted nut. 8. Throw in the chopped herb in the last 5 minutes of cooking and put the cover back on. If you use fresh cilantro, mix it in at the last-minute just before serving. 9. Turn off the heat. Leave it cover for 5 minutes more or so. 10. Mix in half the nut and fluff the quinoa with a fork. Serve immediately or cover to keep warm and serve later. Pass the rest of the nut around the table. Season with if necessary. 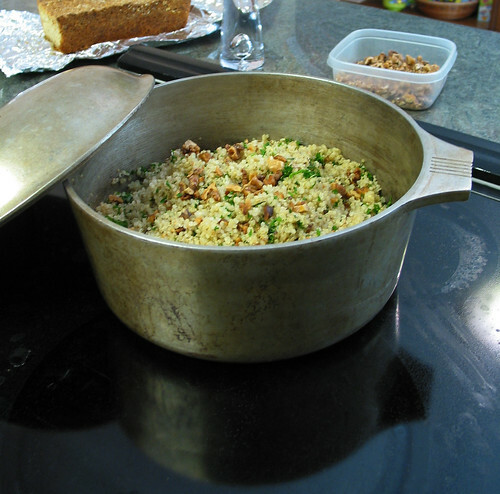 As with any cooked grains leftover stored in the fridge tends to become hard so it’s no different with quinoa. Just reheat it slowly in a microwave at low-powered setting for a few minutes to bring it back to taste. You can even mix in a teaspoon or two of water to moisten if it seemed too hard. I had wonderful leftover quinoa with a fried egg mixed in turning it to a delicious one-dish meal. On occasions I brought it out to room temperature and added it in a green salad. Once I put leftover in a clear soup to give the soup some body and added flavour. The variation is endless. 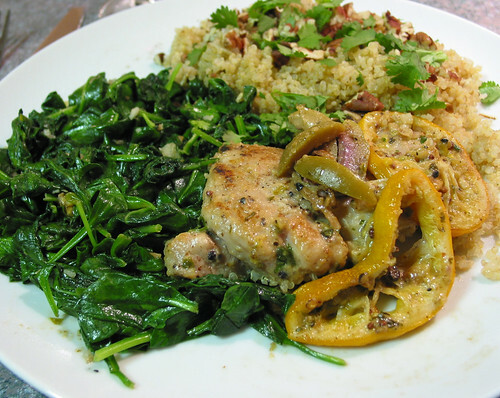 Enjoy this quinoa pilaf with cilantro served alongside roasted Meyer lemon chicken and sautéed baby spinach.